Behind any big, many-tentacled programme like the bangaloREsidency, is always a group of people silently making the whole thing work. 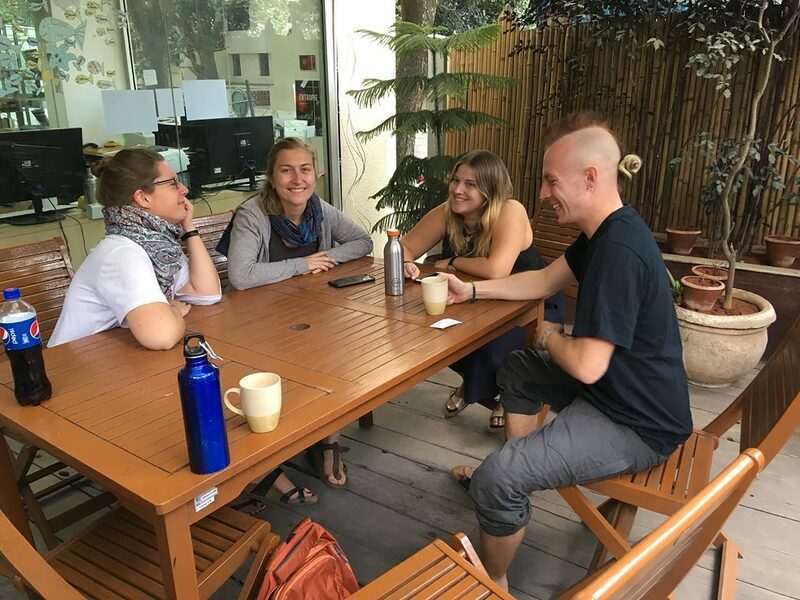 Of the many hearts and minds that work tireless to keep the bangaloREsidency running as smoothly as possible are a group of visitors themselves – the residency’s interns. This year, four interns from Germany – Kerstin Meenen, Liv Hunzinger, Marie Knop and Max Hollerith – kept the ship sailing. Each of them travelled to Bangalore to help with organising and also to observe the residency from up close. All of them artists, art lovers, or students of the arts themselves, they came to interact with fellow artists, as well as to explore a new place. Once the residents arrived, each of them was assigned an intern, who would be their “buddy”. Each intern buddied up with 2-3 residents and was tasked with being their human telephone directory, their Google Maps, and also their shoulder to cry on. Well, only in a manner of speaking. For the time that the artists were in Bangalore, the buddy system gave them a go-to person for everything from clerical information to the best neighbourhood pubs – together, the buddies could help each other navigate Bangalore and its madness. On a typical Monday morning during the bangaloREsidency, the interns were hard at work in front of computer screens in the Goethe-Institut / Max Mueller Bhavan Library. They were not with their buddies, but working to finalise the residents’ final presentations. They were more than happy to step out for some air, when I stopped by to chat with them. At the start of their time with the Goethe-Institut / Max Mueller Bhavan, the interns read through the various residents’ proposals and chose whom they wanted to team up with. “I could have taken all of them,” Marie said, “everything sounded so interesting!” The others agreed, though they admitted that at the time of choosing, they weren’t sure what being a buddy was about. “I kind of knew there was a buddy system,” Liv said, “though I didn’t know what exactly that meant.” Now, being in the thick of it, she revealed that as part of their work as buddies, they send artists tips on what events to catch around the city, help with their social media, and aid them in finding resources for their projects. “It’s the small things,” Marie quipped. When asked if they would change anything for next year, all four interns agreed that they would like a local intern on their team. “We don’t get here that much before the residents,” Marie said, “so often we don’t have ready answers for them. We have to look up areas we’ve never heard of or been to or ask someone else for the answer”, she stressed, “It’s about intercultural exchange so it would be nice to have someone who knows Bangalore better.” “Oh, a basic course in Kannada would be nice, too!” Liv added.